This curriculum has a lot of options for individuals, groups, and families. Their website has a good breakdown of your options. 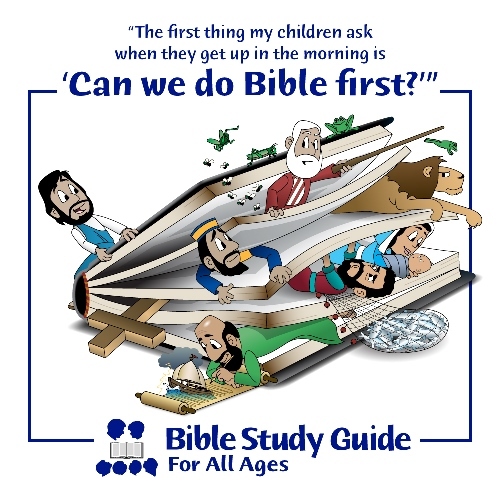 My kids and I loved the chance to try and review Bible Study Guide For All Ages. Because my kids are spread out in ages from 6-11, we got to try multiple levels. We had the Bible Book Summary Cards to use as a group. 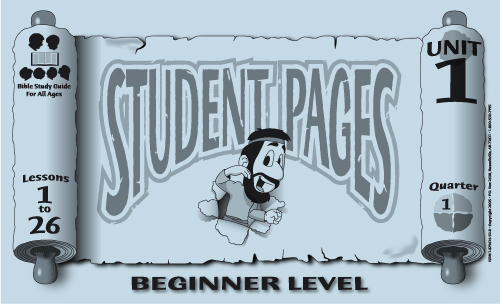 For the various levels, we had: Advanced (5th & 6th grade), including the Advanced Student Pages and Advanced Teacher Key; Intermediate (3rd & 4th grade), including the Intermediate Student Pages (there is a teacher key available), and the Beginner (3-K) – Beginner Student Pages and Beginner Time Line. We didn’t have the Primary (1st & 2nd grade) with Primary Student Pages, and Primary Teacher Guide because none of my kids fit that level during this summer. 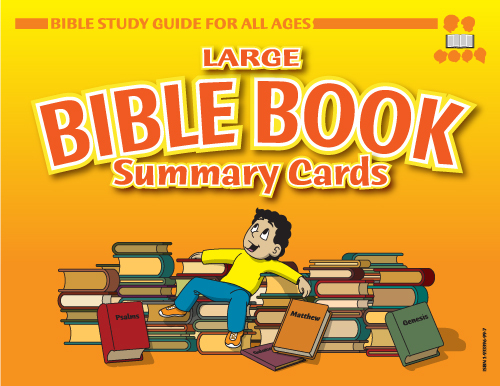 I’ll start with the Large Bible Book Summary Cards because those are the center of everything and used with all my kids. We definitely needed the Bible Book Summary cards. I used a card with each lesson. There’s a photo on one side, and a detailed lesson summary on the back. I basically read the summary with my kids, and we talkd about. We’re a homeschooling family who’s used Christian curriculum for years, so especially my older kids know their Bible stories pretty well, but they enjoyed doing these lessons a lot. The summaries help give context to all the little details. The cards refer to songs, but we didn’t have the CD. We loved this overarching basic message. There’s no fluff. I feel like a lot of adults who have been Christians their whole lives sometimes forget the very simple message of the Bible and the Gospel. My kids are not generally big fans of worksheets, but they liked these student pages a lot because of the cartoony look. 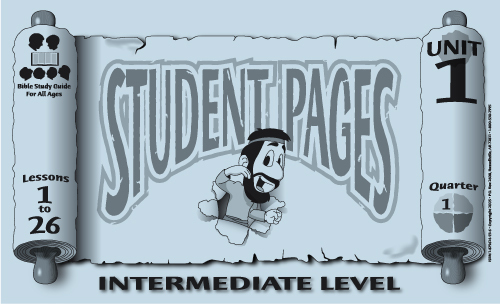 Here are pictures of the same lesson in each level so you can compare the content. The biggest difference is between Beginner and Intermediate, which makes sense because there is a Primary level in between those two. 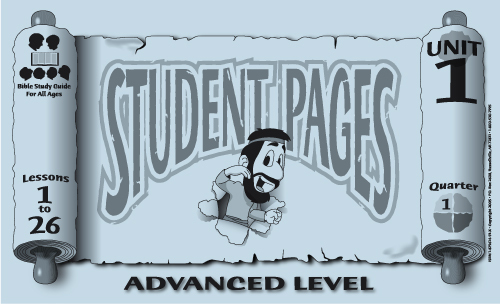 The Advanced level contains more thought-provoking questions and a bit less guidance than the Intermediate level. I think these lessons are all done very well for each age level. I wouldn’t stress a lot about which level to get. Just get the one that goes with your child’s working grade level. We also received the Advanced Teacher Key. This item is necessary if you are doing the timeline intended for older students (Unlabeled Wall Maps and Time Line ). We did the beginner timeline, so this Teacher Key wasn’t necessary, but it was nice to have as my oldest child did the Advanced Student Pages. You can see more sample pages at the website. I didn’t have the Teacher Key for the other levels. We loved it! 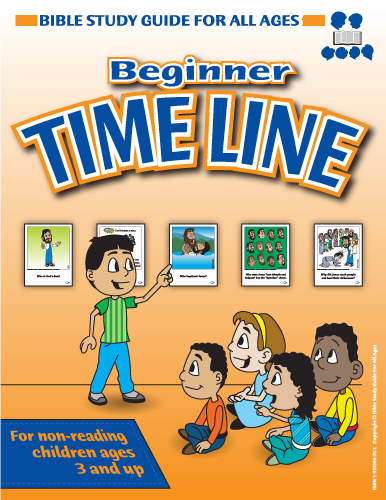 The Beginner Timeline is for ages 3-K (non-reading children). My K’er is not yet reading well, so this was really good for her. All three of my kids loved it. I used my stairway to set it up and it turned out to be a perfect area of our house. I used each card along with the lesson we did, but for the sake of this review, I put up all the cards to show (and see for myself) how they would all fit in the stairway when we’re done. You read each row top to bottom, kind of diagonally as you go down the stairs. The cards have numbers so you won’t get them out of order. I think it worked out SO WELL. The cards are heavier than regular paper and I learned to use a few pieces of tape on each one. I’m sure some sort of thing designed for hanging posters would work great, but tape was fine for us. My 6-year-old squealed with delight when she saw them all up there. The eyesight level of this arrangement is perfect for the kids, and they walk by them multiple times a day and check them out. My older kids, 8, and 11, also loved the beginner timeline cards even though they’re well beyond the intended age range and they already know the Bible stories pretty well. We didn’t get the timeline intended for older children because I heard that it was pretty big and I wasn’t sure where I’d put it in my house. You might find that another of the Schoolhouse Review Crew tried that timeline in their house. For our house, the Beginner Timeline turned out to be a great fit. Wow, this looks like it would be very enjoyable and fun to use. I hope my church friends read this article so they can enjoy using it. I’m going to repost the article. Thanks for sharing the details.